University: Grays School of Art. 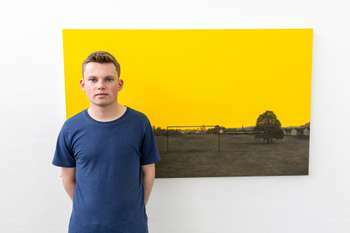 Selected for 2018 RSA New Contemporaries, David Rae is part of a growing interest in the possibility of unspoken narratives through the use of realism and subtraction. Rae’s paintings offer a remarkable sense of space through the realistic rendition of textures and perspective and behind this curtain of reality the figureless, empty spaces suggest an uneasy absence. The resulting imagery has connotations of an unfinished story or a hidden truth, a simple device to incite curiosity. This tension between presence and absence is evocative of the empty spaces painted by Turner Prize winner, George Shaw. Famous for his portrayal of the built environment, Shaw shows the dislocated beauty of the urban versus natural world and similarly, Rae’s work suggestively imitates the beauty of human and natural environments while maintaining a perspicuous stillness which is both disquieting and analytical. The locations forming the basis for my work are mainly those that featured in my childhood, places I've visited or those that are re-imagined. Capturing a sense of place is an important aspect to each piece; alluding to an atmosphere in which I explore the presence of absence. The objects that populate each space suggest human interaction and are based on my wider interests, sport being a prime example. Within the paintings I like to include subtle narratives creating an element of curiosity but not to an overpowering level, just enough to question the viewer's judgement of what the work could be about. The title and compositional elements within the paintings will inevitably offer clues regarding each paintings subject.